A new way to measure word-of-mouth marketing? How The Cirqle looks at it. As consumers are increasingly overwhelmed by a variety of product choices, impulse buying seems to become a trend of the past. Consumers look, ask, search, compare, review, and re-think before purchasing advertised products. The one key element however, that is often forgotten but does fundamentally impact purchase behaviour is a critical one. And that is: Trust. Word of mouth is entirely based on the fact that 92% of consumers trust recommendations from friends and family over all other forms of advertising (Nielsen, 2012). The real question here is: if consumers value word-of-mouth and marketers believe it is effective, then why aren’t marketers more focused on it? One simple answer is the need for tangible measures of word of mouth marketing. 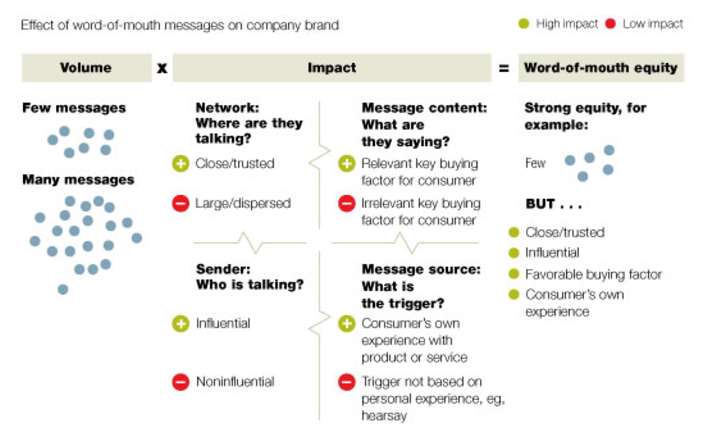 McKinsey’s report (2011), “A new way to measure word-of-mouth marketing”, attempted to provide a new formula to measure the impact of WOM, also called “word-of-mouth equity”. Yet, this impact is measured on the basis of black or white qualitative criteria such as influential or not, relevant or irrelevant message content, close or large network etc. This leads to think that McKinsey’s new measurement tool only results in two-sided answers, far from the tangible output needed to change marketers’ decisions or budget allocations. Our objective is to fundamentally understand how and why specific pieces of content perform better in comparison to others. In order to guide our clients towards the right consumers, through the right content and in the right setting, the interpretation of the right data is of critical important. Thus, we make sure brands understand the value of their investment through personalised and substantial feedback on campaign content and through carefully assessing and evaluation the feedback our technology delivers. This is why we focus on individual content analytics such as impressions, engagement points, followers and demographic data (gender, city, country, age, income data, amongst others) of each influencer and content allocated to a campaign. Coming back to McKinsey's measurement tool, this enables us to look at both volume and impact sides of a campaign. However, the actual impact of a campaign does not limit itself to the above. The Cirqle, calibrates the impact of a campaign throughout the entire campaign management process, moving away from McKinsey’s 4 impact criteria. This process moves from the deliberate recruitment and selection of influencers towards the audience the influencer is actually targeting; to the campaign content and channel selection (beyond the continuous communication b/w brand- and influencer). All these factors are taken into account in in the final impact assessment of a campaign. Despite of these efforts to employ different impact measurements, capturing the campaign's relation to actual customer conversion remains the ultimate goal. A goal which we'll continue to relentlessly pursue and will hope to present our findings for in the next weeks to come. We're announcing a partnership in the next week which we'll hopefully lay the groundworks for helping us to achieve this mission.